Daniel Brett Weiss (/waɪs/; born April 23, 1971) is an American television producer, director and writer, and novelist. Along with his collaborator David Benioff, he is best known as co-creator and showrunner of Game of Thrones, the HBO adaptation of George R. R. Martin's series of books A Song of Ice and Fire. Weiss is born and raised in Chicago, Illinois. His family is Jewish. He graduated from Wesleyan University and earned a Master of Philosophy in Irish literature from Trinity College, Dublin, where he wrote his thesis on James Joyce's Finnegans Wake, and a Master of Fine Arts in creative writing from the Iowa Writers' Workshop. Weiss worked as personal assistant on films such as The Viking Sagas for New Line Cinema. For a brief period, Weiss also worked as a personal assistant for musician Glenn Frey. Weiss went to Dublin in 1995 to study Anglo-Irish literature and met David Benioff, the screenwriter of Troy. Three years later, around 1998, they met again in Santa Monica, California. Weiss and Benioff co-wrote a screenplay for a film titled The Headmaster, but it was never made. In 2003, they were hired to collaborate on a new script of Orson Scott Card's book Ender's Game, in consultation with the then-designated director Wolfgang Petersen. It was not used. Weiss's 2003 debut novel, Lucky Wander Boy, is themed around video games. In 2006, Weiss said he had a second novel finished that "needs a second draft". That same year, Weiss completed a screenplay for a film adaptation of the video game series Halo, based on a script written by Alex Garland. However, director Neill Blomkamp declared the project dead in late 2007. Weiss also worked on a script for a prequel to I Am Legend. However, in May 2011, director Francis Lawrence stated that he did not think the prequel was ever going to happen. Weiss currently collaborates with David Benioff on the television series Game of Thrones, based on George R. R. Martin's book series A Song of Ice and Fire. Benioff and Weiss also directed two episodes together, but used a coin-flip to decide who would get the credit on the show. 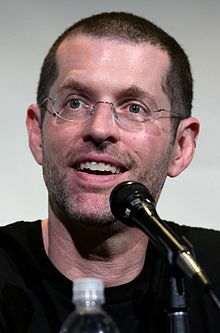 Weiss received directing credit for "Two Swords", Season 4 episode 1, while Benioff was credited for "Walk of Punishment", Season 3 episode 3. Benioff and Weiss will co-direct the series finale. On July 19, 2017, Weiss announced that he and Benioff are going to begin production on another HBO series, titled Confederate, after the final season of Game of Thrones. Weiss and Benioff said, "We have discussed Confederate for years, originally as a concept for a feature film - But our experience on Thrones has convinced us that no one provides a bigger, better storytelling canvas than HBO." On February 6, 2018, Disney announced that both Weiss and Benioff will write and produce a new series of Star Wars films after the finale season of Game of Thrones is completed, in 2019. Weiss and his wife, Andrea Troyer, have two children. Directed and wrote episode:"Two Swords"
2013–2017 It's Always Sunny in Philadelphia Yes Wrote episode: "Flowers for Charlie"
^ "D.B. Weiss Biography". StarPulse. Retrieved 11 October 2013. ^ "The Jewish legacy behind Game of Thrones". Times of Israel. ^ a b c d e "The Surprising Connection Between Game of Thrones and Monty Python". Vanity Fair. March 24, 2014. ^ "Bio". Lucky Wander Boy. Retrieved February 22, 2011. ^ "Game of Thrones: Interview with David Benioff and D.B. Weiss". HBO. Retrieved March 23, 2013. ^ "DB Weiss talks Halo". Writerswrite.com. July 19, 2006. Retrieved February 22, 2011. ^ "Card talks Ender's Game movie". IGN. IGN Entertainment, Inc. April 18, 2007. Retrieved January 1, 2009. ^ "GameSetInterview: Halo Screenwriter DB Weiss". GameSetWatch. July 13, 2006. Retrieved February 22, 2011. ^ Miller, Ross (July 14, 2006). "DB Weiss takes on Halo script". Joystiq. Retrieved February 22, 2011. ^ Fritz, Ben (2006-10-31). "No home for Halo pic". Variety. Retrieved October 20, 2007. ^ Farrell, Nick (October 9, 2007). "Halo movie canned". The Inquirer. Archived from the original on October 18, 2008. Retrieved May 30, 2008. ^ "I Am Legend prequel in the works". UPI.com. September 26, 2008. Retrieved February 22, 2011. ^ "Exclusive: 'I Am Legend Prequel' is Dead, Says Francis Lawrence". MTV Movies blog. May 3, 2011. Retrieved August 11, 2011. ^ Fleming, Michael (January 16, 2007). "HBO turns Fire into fantasy series". Variety. Retrieved February 22, 2011. ^ Hibberd, James (September 26, 2017). "Game of Thrones season 8 directors revealed: Fan favorites return". Entertainment Weekly. Retrieved September 26, 2017. ^ Hibberd, James (July 19, 2017). "Game of Thrones showrunners reveal their next epic HBO series". Entertainment Weekly. Retrieved July 19, 2017. ^ Brenican, Anthony (February 6, 2018). "Game of Thrones creators developing new Star Wars films". Entertainment Weekly. Retrieved February 6, 2018. ^ a b c d "Game of Thrones". Emmys.com. Retrieved April 12, 2017. ^ "2012 Hugo Award Winners". thehugoawards.org. World Science Fiction Society. September 2, 2012. Archived from the original on September 3, 2012. Retrieved April 12, 2017. ^ "2013 Hugo Award Winners". thehugoawards.org. World Science Fiction Society. September 1, 2013. Archived from the original on September 23, 2013. Retrieved April 12, 2017. ^ "2014 Hugo Award Winners". thehugoawards.org. World Science Fiction Society. August 17, 2014. Archived from the original on August 17, 2014. Retrieved April 12, 2017. ^ "'Big Short' takes home top prize at Producers Guild of America awards". Fox News. January 24, 2016. Archived from the original on April 6, 2016. Retrieved April 12, 2017. ^ Leffler, Rebecca (June 14, 2012). "HBO's 'Game of Thrones,' 'Game Change' Win Top Prizes at Monte Carlo TV Festival". The Hollywood Reporter. Archived from the original on June 19, 2012. Retrieved April 12, 2017. ^ "PGA Announced Theatrical Motion Picture and Long-Form Television Nominations for 2012 PGA Awards". TVLine. January 3, 2012. Archived from the original on June 19, 2012. Retrieved April 12, 2017. ^ Chitwood, Adam (November 28, 2012). "Homeland, Game of Thrones, Modern Family, and Louie Lead Television Nominations for 2013 Producers Guild Awards". Collider. Archived from the original on January 3, 2013. Retrieved April 12, 2017. ^ "TV Nominees For PGA Awards Unveiled". Deadline Hollywood. December 3, 2013. Archived from the original on December 3, 2013. Retrieved April 12, 2017. ^ "'American Sniper,' 'Birdman' & 'Boyhood' Among PGA Awards Nominees". Deadline Hollywood. January 5, 2015. Archived from the original on January 25, 2015. Retrieved April 12, 2017. ^ DeSantis, Rachel (January 5, 2017). "People v. O.J., Stranger Things score Producers Guild Award nominations". Entertainment Weekly. Archived from the original on January 6, 2017. Retrieved April 12, 2017. ^ Dupre, Elyse (5 January 2018). "2018 Producers Guild Award Nominations: The Full List of Film and TV Nominees". E! News. Retrieved 5 January 2018. ^ "Television in 2013". British Academy of Film and Television Arts. 2013. Archived from the original on March 8, 2015. Retrieved April 12, 2017. ^ a b A. Fernandez, Jay (February 19, 2012). "Writers Guild Awards: Complete Winners List". The Hollywood Reporter. Archived from the original on June 19, 2012. Retrieved April 12, 2017. ^ "WGA Announces TV Nominations". The Hollywood Reporter. December 6, 2012. Archived from the original on December 6, 2012. Retrieved April 12, 2017. ^ Hipes, Patrick (December 4, 2014). "Writers Guild TV Nominations: 'True Detective' & 'Louie' Lead Way, Amazon Breaks Through With 'Transparent'". Deadline Hollywood. Archived from the original on February 15, 2015. Retrieved April 12, 2017. ^ a b McNary, Dave (February 13, 2016). "WGA Honors 'Big Short,' 'Spotlight,' 'Mad Men' at 68th Awards". Variety. Archived from the original on May 3, 2016. Retrieved April 12, 2017. ^ a b O'Connell, Michael (December 5, 2016). "WGA TV Nominations Include 'Westworld,' 'This Is Us' and 'Stranger Things'". The Hollywood Reporter. Archived from the original on January 6, 2017. Retrieved April 12, 2017. ^ Littleton, Cynthia. "Writers Guild Award TV Nominations: 'The Americans,' 'Handmaid's Tale,' 'GLOW' Grab Multiple Mentions". Variety. Retrieved December 7, 2017. ^ "2015 Nominations". thehugoawards.org. World Science Fiction Society. April 4, 2015. Archived from the original on May 25, 2015. Retrieved April 12, 2017. ^ Gartenberg, Chaim (April 4, 2017). "Here are the 2017 Hugo Award nominees". The Verge. Archived from the original on April 5, 2017. Retrieved April 12, 2017. ^ THR Staff (January 7, 2016). "USC Scripter Awards Unveils Film Nominations, Expands into TV". The Hollywood Reporter. Archived from the original on January 14, 2017. Retrieved April 12, 2017. ^ McNary, Dave (January 11, 2017). "'Arrival,' 'Fences,' 'Game of Thrones' Earn USC Scripter Award Nominations". Variety. Retrieved April 12, 2017. ^ "'Game of Thrones,' 'Black-ish' Top Humanitas Prize Finalists". Variety. January 11, 2018. Retrieved January 11, 2018. ^ Bacle, Ariana (2014-09-05). "Oprah-approved 'Specials' stars intellectually disabled 20-somethings". insidetv.EW.com. Retrieved 2014-09-09. Wikimedia Commons has media related to D. B. Weiss.